YouSiP-IoM is an innovative interconnection SoC solution for smart meters developed by Brite. 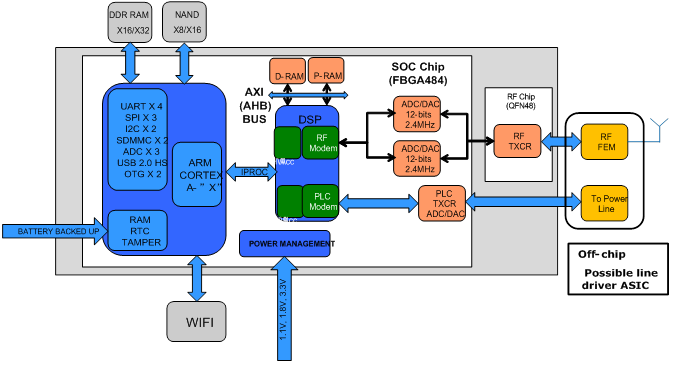 This platform bases on ARM Cortex A7 and Cadence Tensilica LX6 DSP architecture which can provide strong core computing and communication capability. Multiply transmission interface IPs are integrated to support industrial level wire and wireless connection as PLC, IEEE 802.15.4g and WiFi which can bring intelligent and connection to smart water, electricity and gas meters. Abundant peripheral interface containing NAND Flash, LPDDR1/2, SD/MMC, USB 2.0 OTG, UART, SPI, I2C and RTC enable designer to extend sensing function and smart measuring technology and adapt product on various emerging applications and systems. Low power and high security design can assist customer to shorten time-to-market of industrial meter products. Silicon proven YouSiP-IoM platform is an amazing transmission SoC solution to help customer to achieve meter smart, home smart and city smart.